The photo was taken between 1921 and 1931. Front row (l to r): Anna Golditch Harris Goldfine, Barney Cohen and wife Mary Golditch Cohen, Max Golditch and wife Jenny Shapiro, Harry Tobin and wife Dora Golditch Tobin, Caroline Golditch (Jacob's second wife). 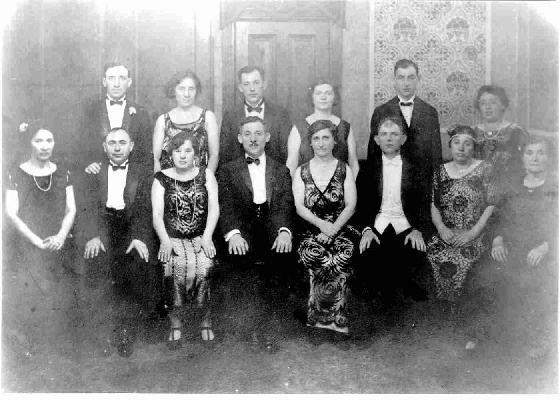 Back row: Al Gomberg and wife Ada Golditch Gomberg, Isadore Golditch and wife Lillian Rothschild Golditch, Abraham Turbin and wife Lena Golditch Turbin. My great-grand parents are Harry Tobin and Dora. Dora's sister, Lena, married Harry's brother Abraham Turbin.